Issues in implementing (Iran-Pakistan Gas Pipeline) IPP project: Prime Minister Shahid Khaqan Abbasi met with Iranian Foreign Minister Dr. Javad Zarif who called on him here at the Prime Minister Office (PMO). They discussed efforts for the strengthening of bilateral relations and issues related to peace and security in the region. Pakistan’s officials confirm their desire to enhance mutually beneficial economic cooperation with Iran including bilateral trade, investments and commercial interaction. They expressed their commitment to work to resolve the issues in implementation of Iran-Pakistan Gas Pipeline Project including the financing of pipeline infrastructure and the scope of snap back clause. Both sides agreed that a peaceful and stable Afghanistan is vital for economic progress of the region and Pakistan and Iran as the two neighboring countries can make important contribution for achieving this objective. Prime Minister thanked the Iranian leadership for their steadfast support to the principled struggle of Kashmiris. The Iranian FM supported the increasing high level interaction between the two countries. He said the mutual efforts of the two countries have resulted into enhanced economic and people-to-people interaction, which should be further strengthened. Dr. Javad Zarif also appreciated Pakistan’s efforts for strengthening border management to prevent unlawful cross border activities. 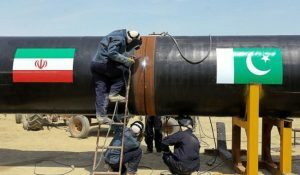 Pakistan has expressed its commitment to work and resolve the issues in implementation of Iran-Pakistan Gas Pipeline (IPP) project including the financing of pipeline infrastructure and the scope of sudden back clause. When the agreement was signed with Iran in 2004, Pakistan had linked the gas rate with the price of oil. However, as oil prices had increased in the international market, the gas imported by Pakistan would also be more expensive. Pakistan has an agreement with Iran that we will buy gas for $15/ MMBTU whereas, Turkmenistan is supplying gas to Japan at a rate of $4/ MMBTU.